Earlier this week I re-posted some research done at Oregon State University showing consumption of broccoli sprouts versus a broccoli-derived dietary supplement demonstrated higher levels of various cancer-fighting compounds in urine plus lower levels of a biomarker (histone deacetylase) for cancer promotion activity in a type of blood cell (both were good outcomes associated with consumption of the broccoli food compared to the dietary supplement). Additional research reported recently from Oregon State University has now shown a second biological mechanism by which Brassica derived compounds may help reduce cancer risk. Both of these biological processes are being studied by scientists interested in an area of study called 'epigentics', a body of knowledge that is increasingly understood these days. I like to think of epigenetics this way. Our genes (DNA) are similar to the keys of a piano, they are what we are born with and cannot change. They are there within each of cells in a certain order and quantity, period, like those piano keys are fixed in a certain order. In the past, it was thought that 'we are our DNA', and thus we were individually 'fated' to have certain diseases or die from one at a relatively pre-determined time frame. However, to expand that metaphor, epigenetics is 'how we play those keys', meaning science has learned there are molecules that actually sit on top of (thus the prefix 'epi') our genes and are the actual factors determining how our genes are expressed or suppressed (i.e., it is not good to have a gene that functions as a 'tumor suppressor' not be expressed, in essence be suppressed!). Aha! Are you thinking 'we are what we eat'? I hope so, because epigenetics gives better understanding and real meaning to that expression. 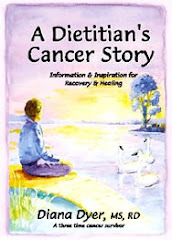 :) Here is where you can read more about epigenetics, as described by Rodney Dashwood, PhD, one of the researchers doing this research at Oregon State University whom I have met through my association with The American Institute for Cancer Research where I donate proceeds from the sale of my book A Dietitian's Cancer Story). This new research from OSU clearly shows two biological mechanisms, epigenetic factors derived from molecules contained in broccoli and other Brassica vegetables, that help to explain the reduced cancer risk associated with increased consumption of this family of vegetables. One-two punch! Of added benefit, many times these processes not only 'talk to each other' as appears to be the case here, but often this 'cross-talk' can result in a synergistic outcome, meaning 1+1 actually equals 3, a larger outcome than if just one or the other mechanism was acting alone. All of which translates to 'eat your veggies', eat a wide variety, eat a rainbow everyday, eat a wide array in all ways (raw, lightly cooked but not 'cooked to death' - wow - that expression suddenly has new meaning!). However, please don't rely on kale or broccoli (or any one food) as a 'magic bullet' (you've heard me say this before) but enjoy all vegetables, including all the Brassicas, all fruits, all whole grains, all nuts and seeds, all beans and legumes, you get the idea, every day, in combination with each other. In my refrigerator right now I have: cauliflower soup (made yesterday), arugula, mustard greens, baby red russian kale, savoy cabbage, rutabaga (not in my refrig), which are easily enough Brassica vegetables to provide my husband and me with at least one serving/day for the entire week. Between the cancer-fighting molecules in the Brassica vegetables and all the other vegetables, hopefully we are getting far more than a temporary one-two punch but a real knock-out against the various mechanisms leading to cell damage and deranged cell growth. No one lives forever of course, but we are certainly going to 1) give cancer a run for its money and better yet, 2) also enjoy the run! Yum, yum!